The Vosges are a range of low mountains in eastern France, near its border with Germany. They extend along the west side of the Rhine valley in a north-north-east direction, mainly from Belfort to Saverne. The elongated massif is divided south to north into three sections : the Higher Vosges (Hautes Vosges), extending in the southern part of the range from Belfort to the valley of the Bruche. The rounded summits of the Hautes Vosges are called ballons in French or "balloons". the sandstoned Vosges (31 miles), between the Permian Basin of Saint-Die including the Devon-Dinantian volcanic massif of Schirmeck-Moyenmoutier and the Col de Saverne,the Lower Vosges (30 miles), between the Col de Saverne and the source of the Lauter. In addition, the term "Central Vosges" is used to designate the various lines of summits, especially those above 1000 meters of altitude. 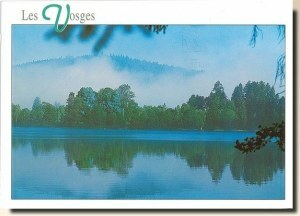 The French department of Vosges is named after the range.